Hardwood lumber comes in random widths. For visual, here's a typical pile of red oak. Each board is a different width. No boards are any narrower than 4", except in unusual circumstances. The amount of wider choices declines once we start talking about 8" and wider. Rarely are any boards wider than 10". 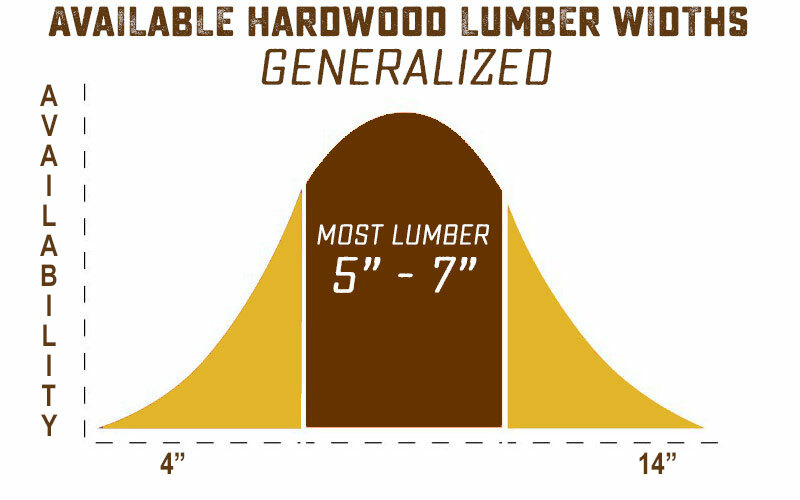 Basically the vast majority of 4/4 lumber is 5" to 7" wide. Thicker lumber, such as 8/4, is often mostly 7"-10". Here's a visualization of what you can expect in lumber widths. Most are 5" to 7". Very little is 12" or wider, and nothing is narrower than 4".